TRUMAN, Harry S. (1884-1972) was the 33rd president of the United States (1945–1953), succeeding upon the death of Franklin D. Roosevelt after serving as vice president. He implemented the Marshall Plan to rebuild the economy of Western Europe, and established the Truman Doctrine and NATO. 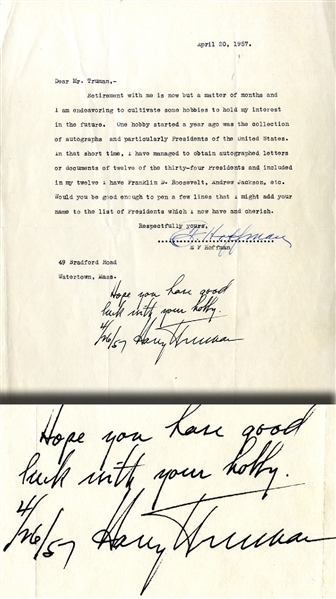 Autograph Note Signed “Harry Truman” at bottom of 1pp. quarto Typed Letter Signed by E.F. Hofmman on April 20, 1957, in which Truman responds “Hope you have good luck with your hobby. 4/26/57” in response to a request for his autograph. Fine condition.